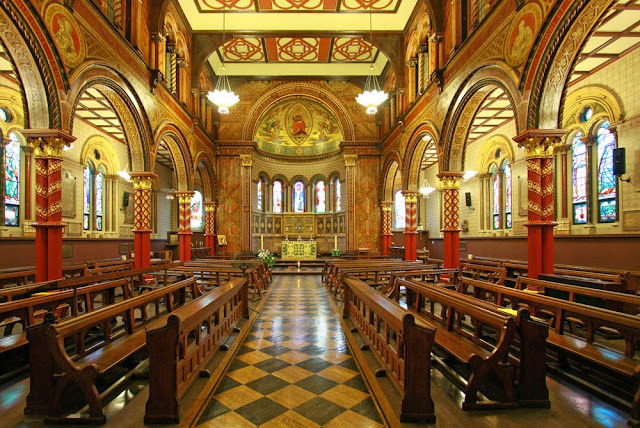 Hidden deep within the Strand Campus of King's College London is a spectacular chapel designed by Sir George Gilbert Scott in 1864, to reflect the "character of an ancient basilica". Despite considerable damage during the Second World War which resulted in the lowering of the main ceiling to accommodate lecture theatres above, the Chapel still retains the grace and charm of Gilbert Scott's original design. When your author dropped in yesterday, light was streaming through Joseph Nuttgens stained glass windows, candles remained on the benches from the previous evening's candle-lit service and a student had just dropped in to begin his organ practice, which drifted down the stairs on departure. The chapel hosts regular services every weekday and the public are welcome to drop in at other times when the Strand Campus is open.